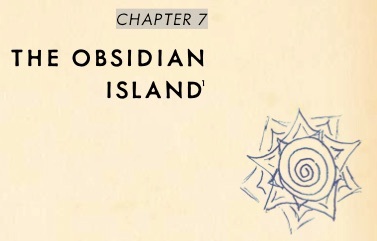 Obsidian Island | Thoughts On "S"
The subject of death fills Chapter 8. FXC calls it noteworthy. She tells the truth. Note that in this chapter S spends time pouring over the photographs of 57 people he plans to reluctantly assassinate. 57 people die in the Interlude (though we are privy to the specifics of only 8). Then, in Chapter 8, S assassinates the Governor, bringing his total to 58. This happens to be the same number of people killed by the bomb on the wharf in B__ (p126). The Obsidian Island itself is described as lifeless. There is no vegetation. The mountain is described as decapitated, a dead mountaintop, and a dead mountain. And at the pinnacle of this deadness we have The Lady. The Lady appears to have already died once (p286-287). She may very well be one of the female crew members of S’s ship – the one who tried to teach the monkey to swab the deck (p265-266) because of the similarities in S’s encounters with them and the fact that this crew member dies by fire in a Black Vine attack on S’s ship (p371-373). The Lady remarks to S that he will die if he refuses to make choices (p288). She explains on the next page that no one lives here, and then she quietly vanishes from the cabin. S thinks to himself, Of course she’s gone. No one lives here. According to the Wikipedia elders, an axis mundi is the connection between earth and Heaven – as is death itself as it transitions from one to the other. It is also viewed as mostly feminine and it may have the form of a natural object, such as a mountain. An axis mundi has the privilege of having no concept of time or space, since it is suspended between earth and heaven. 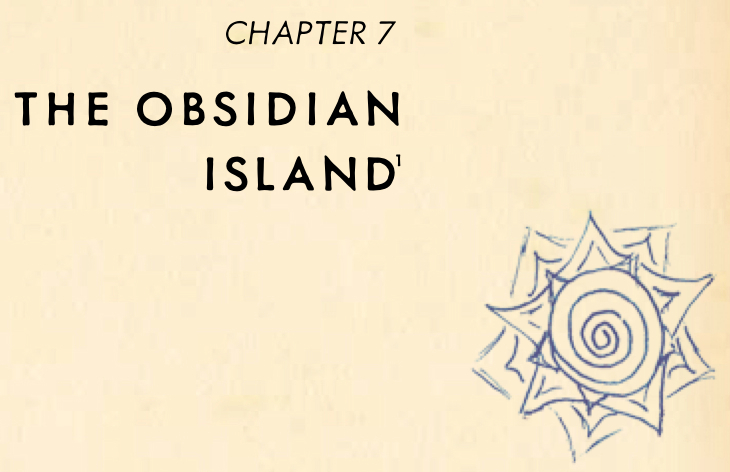 On p278 and 284, the Obsidian Island is referred to as Nowhere. (Recall on p33 that Maelstrom told S he had ‘structs to take S no where. Also, in this chapter, S asks Maelstrom how time works on the ship. The Obsidian Island seems to be the place where time, space, and life are all suspended temporarily at the axis mundi of Ship of Theseus. So what do we make of all the “workin’s” of the crew – the papers in the crates being stored in the warehouse below at the same time that S receives words of warning from The Lady above?